How do I add custom agency forms to my Forms Engine? You are able to add your own forms to the Forms Engine in addition to the forms from the carriers. 3. Log into the Dashboard with an Admin account. 4. Click the profile in the upper right-hand corner. 5. Click "Agency" in the dropdown. 6. Click "Settings" at the top of the page. Select "Forms" in the dropdown. 7. Click "Upload New Agency Form" in the upper-right hand corner of the card. 8. You should now be looking at a screen similar to the one below. Use the fields to upload and configure your custom form. PDF File (required): Click the box to upload your form to the Dashboard. This file must be a PDF file type, and less than 2000k in file size. Name (required): This is the name that will show up in your Forms Engine. Description: This should be a description to help your agent identify what the form is for. This is may include, summaries about what the form is used for, ID numbers, etc. Categories: This will control which tabs the form will be categorized under. Products: Check the box next to your Forms Engine, and any other products you would like the form to be visible in. 9. Click "Save" in the upper right-hand corner. 10. Congratulations! You have now added a custom form to your Forms Engine! 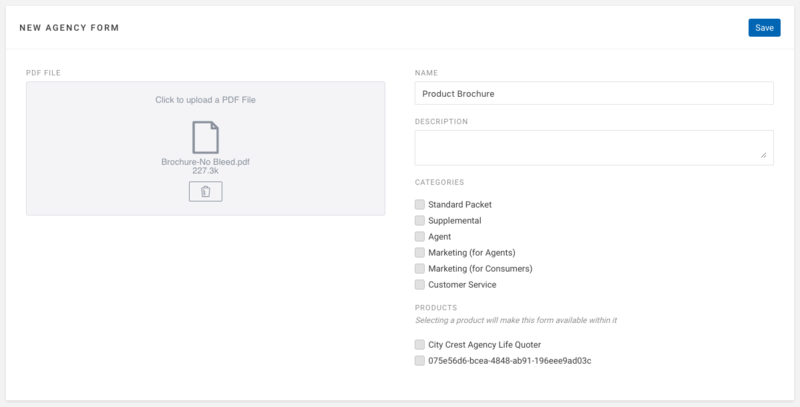 To view the forms, request forms using your the Forms Engine, then select the category that you assigned to the PDF.